On a break from picking kohlrabi are the Rutners, from left, Juliet and Torin and their children Chana, Rachel, Elana, and Jacob, holding his certificate of appreciation from Leket. 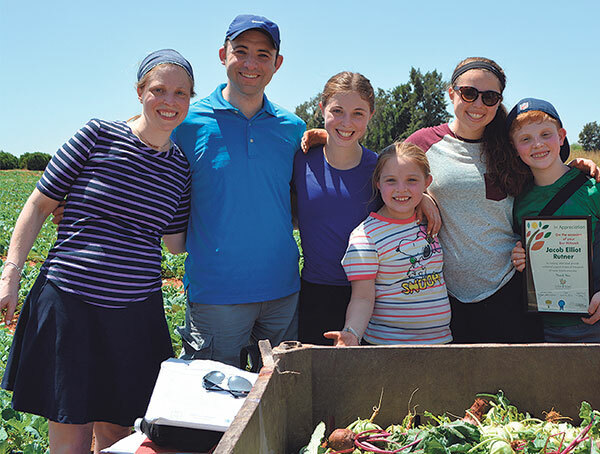 ON JACOB RUTNER’S SIXTH visit to Israel, in April, he celebrated his bar mitzva and involved his parents and siblings in his mitzva project — harvesting produce for Leket, Israel’s national food bank and leading food rescue organization. 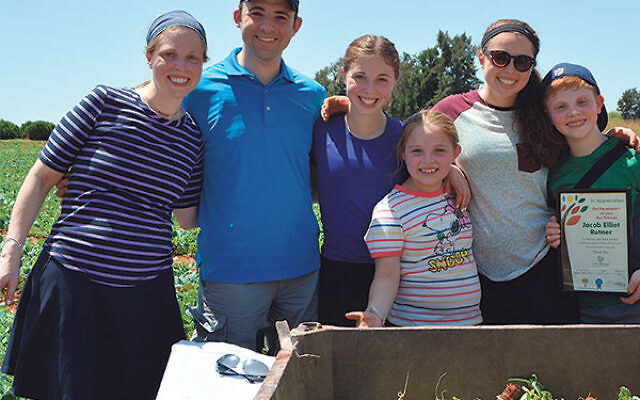 On their first day in Israel, the Rutners of West Orange — parents Juliet and Torin with four of their five children — spent the morning picking kohlrabi in the fields of Kvutzat Shiller, a kibbutz in central Israel. Jacob, a rising eighth-grader at Joseph Kushner Hebrew Academy in Livingston, enjoys gardening at home and said he chose the Leket project because he wanted to help the people of Israel. The Rutners are members of Ahawas Achim B’nai Jacob & David in West Orange, where Jacob celebrated his bar mitzva in June. Leket’s donated food — a combination of prepared meals, fresh produce, and surplus dairy and packaged goods — reaches more than 175,000 people each week. The Rutners were told that the kohlrabi they picked would appear on the tables of needy families for their Passover seders. Jacob said he was “blown away” by the gratitude displayed by the Leket staff toward their volunteer gleaners and that he is eager to pick produce for Leket on a future trip to Israel.